In November 2004, shopping centre billionaire Frank Lowy walked into a packed media conference and announced the creation of a new professional football league. Armed with $15 million of government funds, Lowy was about to wake the sleeping giant of Australian sport. The A-League kicked off in 2005. Over the competitions first decade it has seen more than its fair share of drama, on and off the field. International superstars have come to play, eccentric billionaires have bought and sold franchises, and clubs have folded after haemorrhaging millions of dollars. Yet the football has been passionate and captivating, and attendances and television audiences have grown as Australians have embraced the game as never before. Relying on unprecedented access to key figures in the code, John Stensholt and Shaun Mooney reveal the true story behind the A-Leagues first ten years: the egos, the power plays and the rows between some of Australias richest men as they try to make the world game Australias favourite sport. Money, power, ego and ambition. Throw in the odd football match and you have the story of the A-League from forgotten game to unforgettable glory.Francis Leach, ABC Once I started, I couldnt put it down. 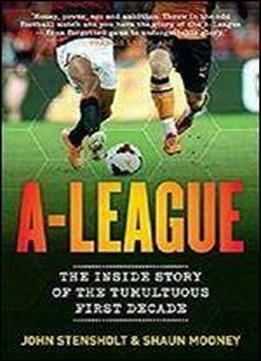 A wonderful and riveting insight into the first decade of the A-League.Ray Gatt, the Australian Theres enough in this for a 20-year period, such has been the last decade in Australian club football. Entertaining, informative, this covers it all the good, the bad, the ugly.Adam Peacock, Fox Sports Shaun Mooney is the publisher of football journal Leopold Method, and has contributed to the Guardian Australia. Previously, Shaun wrote articles on retail and small business marketing, which were syndicated across six countries. He has also co-authored two business books. John Stensholt is an award-winning journalist for the Australian Financial Review, and edits the BRW Rich list. His work has also appeared in the Age, the Sydney Morning Herald and the Financial Review Magazine.